The Paradox trail is a 118 mile route that connects the Tabeguache trail near Montrose, Colorado with the Kokopelli trail near Moab, Utah via old jeep roads and newly constructed singletracks. Together the Tabeguache, Kokopelli and Paradox trails form what is known as the Grand Loop. 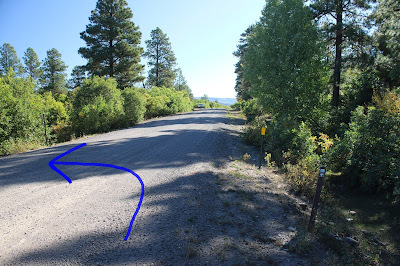 This post covers the Uncompahgre Section of the Paradox trail which begins on the Uncompahgre Plateau on the Montrose end where it connects to the Tabeguache trail. The Paradox trail connects to the Kokopelli at the Grays Creek trail in the Pool Creek Section of the Kokopelli trail about 27 miles west of Montrose. The best route there from Montrose is to follow Highway 90 to where it becomes Divide Road. From there continue for another 3.5 miles and turn right. 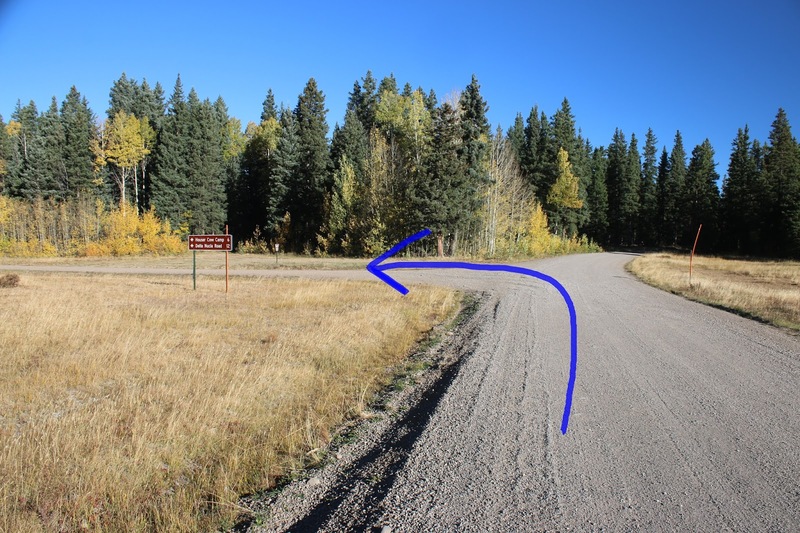 Once you turn right it is only another 200 feet or so to where the Kokopelli/Grays Creek trail cross the road and the Paradox trail begins. The Paradox trail starts out by heading back out to Divide Road and turning right. 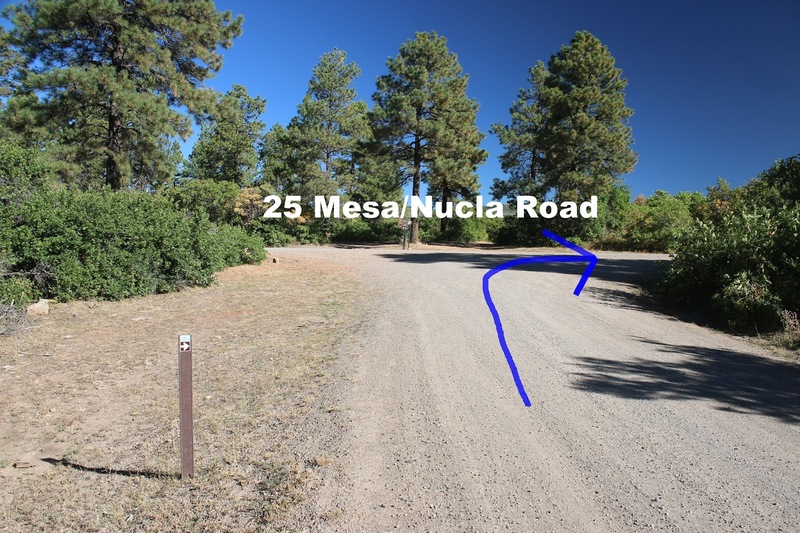 From there the trail follows the Divide Road for about 3/4 of a mile before it turns left onto Forest Road 603. As the trail gets headed down FR 603 it is crossed by the Parallel trail. 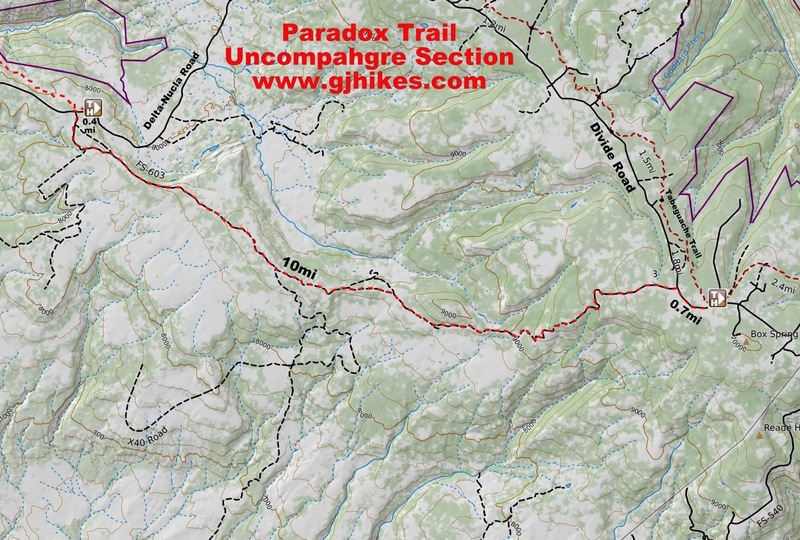 At this point the Paradox trail begins its descent off of the Uncompahgre Plateau. The forest provides a peaceful setting that alternates between aspens and pine trees. The only water sources that we noticed were stock ponds from which a person would have to be pretty desperate to drink even after filtering it. The trees give way to oakbrush in places where among other things you can see all the way over to the La Sal Mountains in Utah where the Paradox trail comes to an end. Even though the Paradox trail is 118 miles long the line of sight distance from end to end is only 56.4 miles. The stretch of the trail that follows FR 603 is right at 10 miles long. At that point it meets up with the 25 Mesa/Nucla-Delta Road where it turns to the right. While the Delta-Nucla Road is traveling through the boundaries of the Uncompahgre National Forest most of the road signs refer to it as FR 503. The Paradox trail only follows it for less than a mile before it turns off on the left. 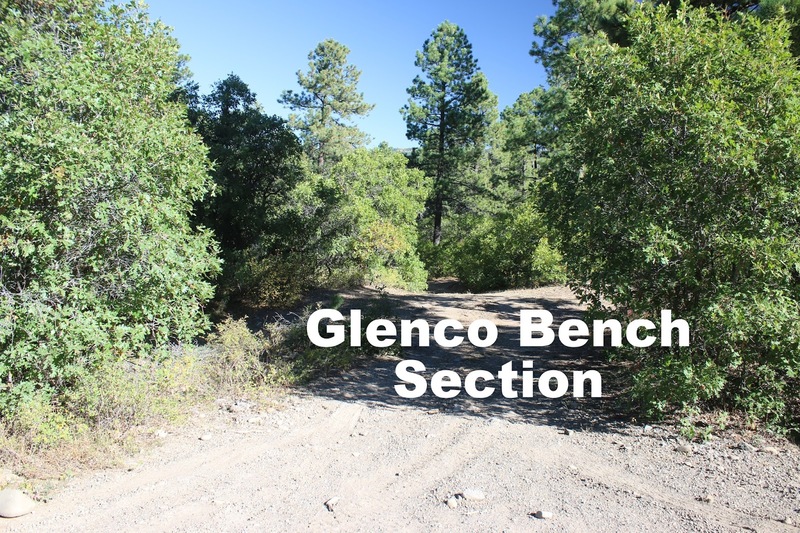 This marks the end of the Uncompahgre Section and the start of the Glenco Bench Section. We broke the Paradox trail into sections that mostly correspond with the type of travel they permit and where there are spots that serve as natural trailheads. When FR 603 is in good condition it is easy enough to drive in a 2-wheel drive vehicle. Going in this direction the Uncompahgre Section couldn't be much more pleasant. On a mountain bike it is an easy roll. If you would like to see it for yourself then all you have to do is 'Take a hike'.